Owing to our expertise in this domain, we have been able to provide the customers with a commendable assortment of Dining Table Palcemats. The offered range is widely used on dining tables in corporate offices and homes. Also, the range is used for keeping hot crockery and utensils as it prevents burning and damaging of the table. Designed elegantly, these table placemats add on to the charm and grace of the dining area. Also, the range is appreciated for contemporary colors, colorfastness, shrink resistance, easy wash and intricate designs. 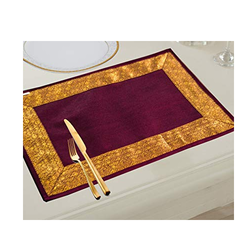 Abiding by the ethical norms of the industry, we are also engaged in manufacturing, trading and supplying a commendable assortment of Dining Table Placemats. Designed using pure bamboo sticks, the range is available in a wide spectrum of sizes, designs and patterns, which can also be customized as per the clients' requirements.